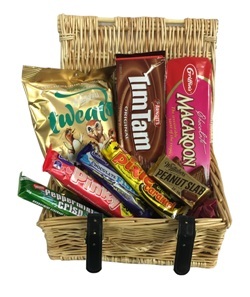 The goodies are presented in an attractive wicker hamper. We will also gladly include a personalised message. Please note: Subject to availability, some products may be replaced with a like item. How long will a gift basket last for? When preparing a gift basket, we will make sure that each product has a best before that is at least longer than a month, so the recipient has time to enjoy it. Milk Chocolate contains Cocoa Solids 33%, Milk Solids 17%. Contains 32% Milk Chocolate and 15% Coconut. Sugar, Glucose Syrup, Cocoa Mass, Invert Sugar, Cocoa Butter, Gelatine, Milk Solids, Emulsifiers (Soy Lecithin, E476), Colour (E120), Flavours. Sugar, Glucose Syrup, Milk Solids, Invert Sugar, Cocoa Butter, Palm Fat, Cocoa Mass, Golden Syrup, Gelatine, Butter (from Milk), Emulsifiers (Soy Lecithin, E476), Humectant (E422), Flavours. Full Cream Milk, Sugar, Cocoa Butter, Cocoa Mass, Milk Solids, Biscuit Pieces (Wheat Flour, Sugar, Palm Fat, Cocoa Powder, Raising Agents (E500, E503), Salt), Invert Sugar, Wheat Glucose Syrup, Thickener (E1422 (from Wheat)), Emulsifiers (E476, Soy Lecithin), Glazing Agent (Palm Oil, E903), Flavours, Colour (E163), Food Acid (E330). Cocoa Mass, Cocoa Butter, Sugar, Emulsifier (Soy Lecithin), Natural Flavour, Vanilla Flavour), Ginger Pieces (10%) (Ginger (56%), Sugar, Acidity Regulators (Citric Acid, Sodium Bicarbonate)), Freeze Dried Mandarin Powder 0.3%. Dark Chocolate contains Cocoa Solids 62%.